It all began in Godhra - or so the right-wing saffron combine (Bharatiya Janata Party (BJP), Vishwa Hindu Parishad (VHP)and Bajrang Dal) and its government in Gujarat maintain. On February 27, the coach of a train carrying 'kar sevaks' (religious workers) was set on fire by a mob, killing 58 of them. Gujarat Chief Minister Narendra Modi, calling this a "terrorist attack", dubbed the carnage that ensued from the next day as a justified "reaction". It left more than 700 killed, with the numbers still mounting, and tens of thousands homeless. 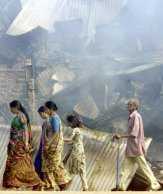 However, investigation reveals that what happened did not have its genesis in Godhra -- it lay in the long-term plan to cleanse Gujarat state of its 8.73 per cent Muslim population. As part of its game plan, the VHP had even issued pamphlets calling for the economic boycott of Muslims. And no one was spared - not even judges, police officers, Members of Parliament, pregnant women, infants, children, young men, greying older men and women, teenaged girls, mothers. These events are memorable for the intensity of the violence, the brutality and meticulous manner of destruction. Muslims were attacked in cities and villages across the state, their property burnt or looted and their houses and business establishments reduced to ashes. Entire Muslim localities have been reduced to rubble, mosques all over the state have been burnt, Korans reduced to ashes and temples have started sprouting in impromptu places where there were shops or mosques. All this while law enforcing agencies watched and took part actively along with politicians, peoples' representatives and professionals from all walks of life in utterly destroying the foundation of civil society. Everywhere in capital Ahmedabad and in smaller towns and villages, refugees of this carnage now live in camps, schools or people's houses. The numbers could be about 35,000 or more in Ahmedabad alone. In rural areas like Sardarpura in Mehsana district, the victims have shifted to other villages which are more friendly. Though they have been given clothes, food and shelter, toilet facilities are non-existent and bathing a forgotten luxury. Only a small Citizen's Initiative (a loose grouping of concerned individuals and non-government organisations) is distributing relief supplies. This Initiative has also started building toilets apart from providing desperately needed psychiatric counselling services. But there is a lot more that needs to be done. The task is not easy; at least in Mumbai, during the post-Babri Masjid demolition riots in 1992-93, there was a massive outpouring of relief from all sections of society, which is absent in Gujarat. The contrast is more marked as there was such an outpouring of relief after last year's earthquake in the state. For the survivors of the genocide at Naroda near Ahmedabad, justice and sanity are now alien. "Why don't you export Muslims to another country?" asked Iqbal Malik, an auto rickshaw driver from Naroda, where the carnage claimed over 20 lives. Shah Alam mosque, a historic symbol of religious unity, is now a refuge for over 6,000 people. Community leaders are providing food, and even clothes and people live under large tents. "Only Allah is our protector. We have no one else now," said greying Zubeidabibi Ahmed Mia, who escaped with her life. While the death toll is still mounting, there are three major questions which need to be addressed from a long-term point of view -- security, sanity and justice. Most people don't want to return to their homes - who will guarantee their safety? There is a terrible sense of loss, that no justice will ever be done and the perpetrators of these events will go scot-free. Moreover, the rural areas are being totally neglected and there are no interventions. 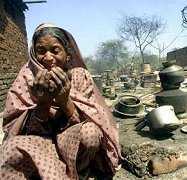 People don't have any money and are dependent on relief only from the Muslim community. Understandably, there is a tremendous sense of isolation. Women, especially those who have seen the violence and have been sexually assaulted, are bereft of any specialised interventions. Some women have lost their entire families. Older women and men too have been assaulted and in some cases, have no one left. Many children have been attacked and their future seems forever tainted by these incidents. This is a major area where some intervention is necessary. Reaching out to the people is important as also providing some cash allowance. The government's lack of interest and justification of this violence is compounding the situation. The important thing now is to reach out and let those affected know that all of us care deeply about what has happened and help them to fight for justice as well.
' It all began in Godhra - or so the right-wing saffron combine (Bharatiya Janata Party (BJP), Vishwa Hindu Parishad (VHP)and Bajrang Dal) and its government in Gujarat maintain. relief after last year's earthquake in the state.